EN IEC 62442-2 ed. 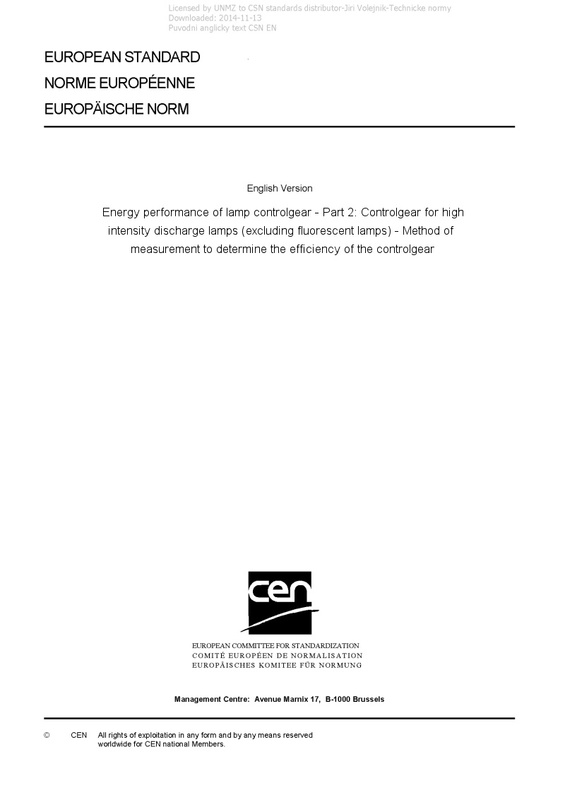 2 Energy performance of lamp controlgear - Part 2: Controlgear for high intensity discharge lamps (excluding fluorescent lamps) - Method of measurement to determine the efficiency of the controlgear - IEC 62442-2:2018 RLV contains both the official IEC International Standard and its Redline version. The Redline version is not an official document, it is available in English only and provides you with a quick and easy way to compare all the changes between the official IEC Standard and its previous edition. IEC 62442-2:2018 defines a measurement method of the power losses of electromagnetic controlgear, the total input power and the standby power of electronic controlgear for high intensity discharged lamps (excluding fluorescent lamps). A calculation method of the efficiency of controlgear for high intensity discharged lamp(s) is also defined. It is assumed that the controlgear are designed for use on DC supplies up to 1 000 V and/or AC supplies up to 1 000 V at 50 Hz or 60 Hz. This second edition cancels and replaces the first edition published in 2014. This edition constitutes a technical revision and has been harmonized with IEC 62442-1 and IEC 62442-3.